I bought some elastic thread a while ago and finally got around to designing a crocheted headband today. 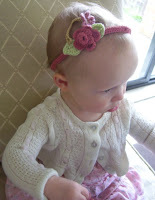 The stitches are worked over the elastic to make the headband stretchy and help it stay on little heads. I tried to get some nice pics of Holland modeling it and managed okay though she didn't want to sit still. I thought I'd be clever and give her something to be distracted with. I had another little crocheted flower nearby and gave it to her. This picture shows exactly what she proceeded to do with it! This was the clearest photo I was able to get and completely unusable! :) lol Kids!